Our Solar Street Lights are of highest quality an at a reasonable price. Saurya EnerTech ensures the quality and provides guarantee and extensive customer support on all of it's products. We have established a strict quality control and ensure that the solar street light is at a reasonable cost. 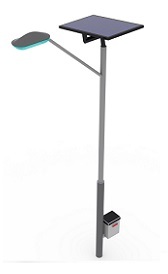 Selective height of the Pole as per Customers requirement up to 15 feet. Longer life MS mechanical Structures and Battery Box. Module 2 x 37 Wp or 1 x74 Wp based on the Configuration. Luminaries Housing Weather Proof with High illuminative acrylic& reflector.